You must make reservations at least 5 minutes in advance of the time at Twin Oaks Country Inn. Dinner: Tuesday - Thursday 5:00pm - 9:00pm, Friday - Saturday 5:00pm - 10:00pm, Sunday 1:00pm - 7:00pm. Our Banquet facility has a capacity of 200 people with a full service or custom designed menu's available. 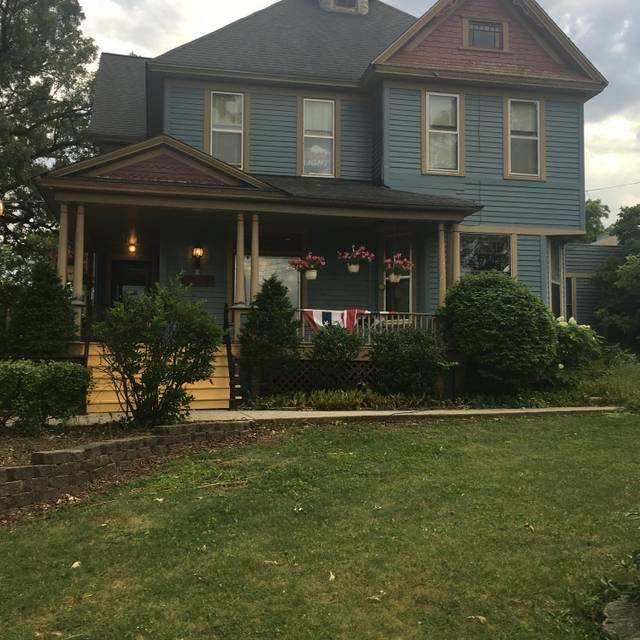 Twin Oaks Country Inn is a charming, casual restaurant and Banquet facility located in Wilmot, Wisconsin in a 123 Year old Victorian House. With foodstuffs and locally grown products in addition to meats, fish and vegetables brought fresh from the markets in Chicago, the menu is an ever evolving list of decades of tried and true recipes as well as innovative new flavors. An award winning wine list and well rounded variety of spirits certainly appeals to all. Attention to detail is a priority with an emphasis on personal attention. It truly is Kenosha Counties Best Kept Secret. It was my birthday. I added this to the Open Table reservation. My wife even told the waitress that it was my birthday dinner when she gave us the dessert menu. The blueberry cobbler was excellent- the waitress did bring out the dessert with a candle on it. But the n I was charged $7 fir the dessert. Maybe I’m wrong, but we go out for each other’s birthdays every year, and never before have I ever been charged for this. This was one issue. Second issue was my NY Strip. I clearly told the waitress up front if it was black, I did not want it. She went into a dissertation about the difference between blackened and char broiled. I told her I’ve eaten at steak houses all over the world- whatever lingo you happen to call it- please do not bring it back black. It came very black. She asked how our meal was after delivering it- and I told her I did not want it black, and it’s like a lump of coal black. She asked if I wanted to take it back- I said no. I spent the better part of dinner trying to scrape off that bitter charcoal flavor. We’ve been. Going to this restaurant maybe once per year for the last 10 years. I think we’ve made our last visit. Very Pleasant atmosphere. Service was good but not great. Menu was comprehensive with a variety of food offerings. Enjoyable dining experience. Only suggestion would be to get rid of or change cheesy potatoes. Not very tasty and was the unanimous opinion of the entire table. It was a very relaxing time for my wife and myself. Everything was all up to par. I dine at Twin Oaks with some regularity. As usual, we all had a first class meal with superb service in one of their quiet dining rooms. Kudos to the entire staff! Absolutely loved the atmosphere and the creative menu. Food was above expectations. Great place for some old school. Beef Wellington was amazing and cooked perfectly. They also made a perfect Rye Old Fashioned. A favorite of ours! The service is impeccable, the food is always consistent and selections are nice! Not the same as many restaurants. Wine selection is also good. Worth the drive and worth it! One of my most favorite places to dine. Always worth the drive. The food and service is unsurpassed. Overall the food is good. They can improve by cutting down on the salt and the heavy cream on pastas. Excellent as always. The mushroom soup is one of my favorites. All 3 of us had different entries and all were exceptional. Since we are getting older our wonderful meal turned into an excellent lunch the next day as well. 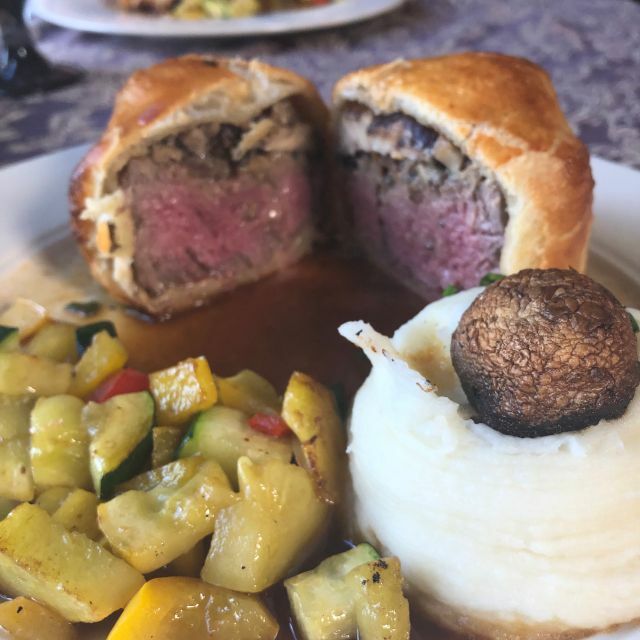 If you like, or never had, Beef Wellington before, then I would highly recommend. Always delicious! Everyone that works there are friendly and accommodating. The food was excellent and they didn’t chase us out as soon as we were done eating. They let us sit and talk for as long as we wanted. The food is exceptional. The service was very attentive. The noise level was such that conversation was easy. I'll be back and bring friends. The weekdays are very low key in the winter. Like an empty dining room. Our food was good I can't deny them that. Our waiter was less than friendly. Twin Oaks has SO much history and great stories for friendly conversation with customers. We did try and talk but he was either shy or not interested. There were only 3 other couples eating that night. That was the most disappointing about our dinner. Our dinner experience was absolutely perfect. Kathy was a delight and efficient. We both had a difficult time deciding what to have for dinner, so many choices. My companion had the perfectly cooked prime rib and I chose the creative tasty duck breast. The chef outdid himself on the duck breast with sautéed arugula beats and fried leeks. Thank you for a most delightful evening. Excellent food and service. Nice upscale restaurant in a quiet area and setting. Jackie really did a nice job taking care of us. Beautiful old Victorian House redone into a Supper_Club_like atmosphere. I could tell on the first spoonful of soup that this was definitely a place run by a real Chef ! It just has a taste far above most "eat_places". Ribeye steak was done to a tender turn, and the cheesy potatoes it came with were delicious. Definitely on my RETURN_TO list. Romantic place in a quaint little Wisconsin country town. Close to Chicago and suburbs. My wife found it by chance when we were planning a "tubing" trip on Wilmot Mountain near there. Great food, great ambience, great people and service. Went this most recent time for a Valentine's day celebration and my wife was very pleased with my choice. She suggested we try to go for each Season and I agree. Prices are reasonable, definitely not what I'd expect to pay in the Chicago area. The food is outstanding and imaginatively prepared. Everything was great. There was a table with a woman who talked so loudly it was an unfortunate element to the dinner. We love Twin Oaks and will return soon.! We had a very enjoyable evening there. The waiter was fantastic as well as the food. The atmosphere was almost like having dinner at grandmas house. I would not hesitate going again. My favorite restaurant to dine at hands down. It's such a cute restaurant with a ton of charm. You feel as though you've transported to a prior century. The decor and architecture is what really makes the place. The food is outstanding as well, especially the beef Wellington. Definitely get a local vibe, since every time I've been here the wait staff is always speaking to guests by their first name, and ask how the family are doing. My wife and I have eaten here a number of times. We have always eaten excellent food, cooked to perfection and served by extremely helpful and courteous staff. We have been going to Twin Oaks for years. We have never had a bad meal or poor service. I love the old house the the restaurant is located in. Excellent as always! Everything was perfect! The service, food selections and ambiance was perfect! Great food and setting as always, love this place !! We got to the restaurant early and got a nice window seat. The menu had a good number of items to choose from and both my wife and I thought the food was excellent. It is a little more than we normally pay for meals but since the food is excellent, we like to treat ourselves every once in a while. Great atmosphere in a Victorian, country setting. Food was fantastic! It was extremely noisy though there was a father/daughter dance in the hall and many were having dinner prior to the dance so that attributed to the noise level. My husband ordered the ribeye and it was charred, on the outside, a bit overdone and not juicy. He ordered a baked potato instead of the mashed and it came much later than the meals and was cold. I ordered the gnocci and it was somewhat mushy. On a positive note, the ambiance is quite appealing and our server was outstanding. Very quaint setting with great food and service. Great place to enjoy dinner with friends with low noise level so you can talk. Lots of menu choices and apple desert was great! Wonderful hidden gem in Wilmot! Lovely old home converted into a restaurant with a supper club feel to it. Food was wonderful and cooked to perfection and service was great! Bar area is tiny but the bartender was wonderful! Will definitely be back! We have always loved taking friends to Twin Oaks for the first time! The last 2 times we were the last party to leave! The staff was very accommodating and friendly. We love this place. The food is great and the place is wonderful. One major drawback though is that it is often very cold in the dining room, especially near the floor. When it’s cold outside and people are coming in, the cold air rushes in and settles around your ankles. GREAT food and service !! I will preface this in that I really like this restaurant. This particular night it was very crowded, and the food was disappointing - not nearly as good as in prior times here. Service was slower due to crowd, but our server was great. I will give it a rest for a few months before I go back. Always a wonderful experience!!! Great food, super nice waitress! What a nice evening enjoying a delicious meal of steak and vegetables as well as two excellent desserts. I will be back and look forward to going during the spring or summer and not on a super cold winter night.